Having troubles playing a Bluray disk /or DVD? 1) Does your optical drive support Blu-ray disks? Use VSO Inspector (free) to see if your drive supports blur-ray disks. 3) Maybe the video player software you are using is not compatible with Blu-ray disks? Try playing the file with our free media player which supports decypeted Blu-ray disks. - When you try and play the disk in VSO Media Player and you see the contents of the disk listed on the left in a playlist, but double clicking on some or all of them, does not result in the file being played. All you see is "Please wait . .." appear but with no real action happening afterwards. In order to play the contents of a protected disk you must have a decyptor software tool installed and active. *Make sure legally you are allowed to use these software products in your country. How these tools work: When the decrypter is running, it works as a background process, making the disk readable so that software or you can access the contents directly. Without a tool like this the contents of the disk cannot be seen. Once your decryptor is running and "active" you should be able to load the video into your video player and play the contents without a problem. If the playback is slow or choppy this could be due to the fact your computer is not powerful enough to handle this process or problems within the video player software itself (try a different player for comparison). Once AnyDVD is installed, launch AnyDVD so that in the bottom right hand corner of your computer you see a little icon in the shape of the head of a fox. If the icon is not in color that means AnyDVD is not running actively. To have it run, right click and select "Enable AnyDVD"
Now the Blu-ray Converter will be able to access and read the contents of the disk for converting. 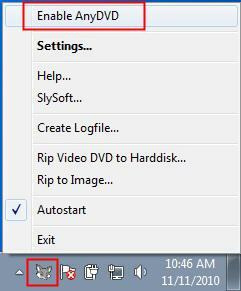 To see if AnyDVD has removed the protection of the disk, go to Computer and right click on your drive where the Blu-ray disk is inserted, and select "Open"